Description: This tear drop with the international pro-life symbol, "Precious Feet", the exact size and shape of an unborn babies feet at 10 weeks after conception, is worn in memory of all the women and preborn children harmed by the abortion industry. I was wearing this one and someone who saw it immediately wanted to know where I had gotten it. I told them I would place another order and gave them mine for the time being. I am reminded, in wearing this, of all the tears God must be shedding over all the abortions being done in this country of ours. The design is truly unique. It makes people stop and think about the sadness of stopping a beating heart. 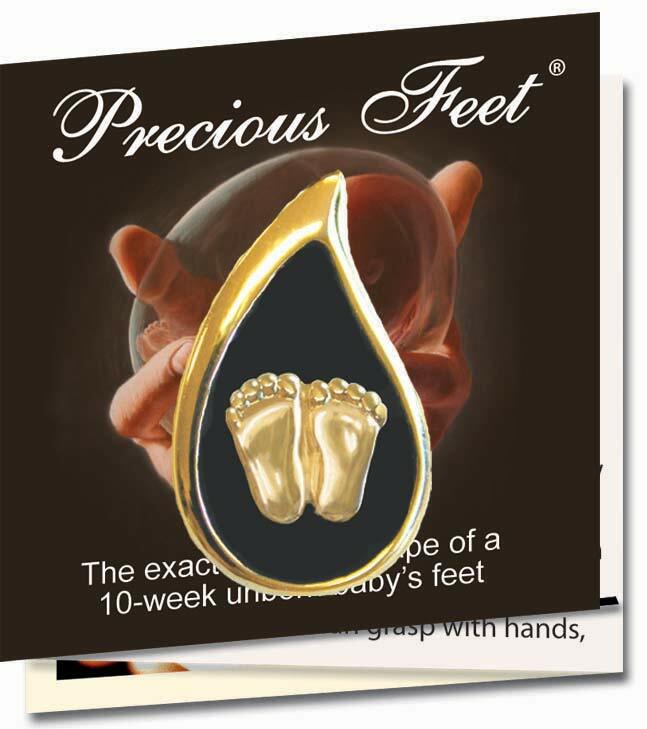 We use these Teardrop Baby Feet pins when we "pin" our advisors at our Pregnancy Center. Only trained advisors receive them. It is a special way to commemorate their special day of completing training and to honor all of their hard work. I bought these for my board members. They loved them. They're great for starting conversations. 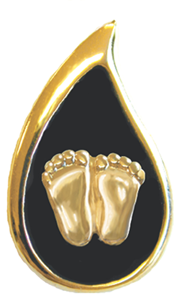 The design of the precious feet in a tear drop is very beautiful and has caught the eye of people when I wear it. 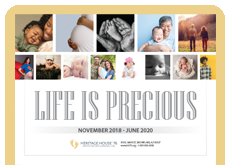 To me, it has multiple symbols: God's teardrop when a life is ended by abortion, my own tears over the years as I serve respect life ministry, and, on a positive note, the idea of a baby in the amniotic sac.